Pure Dancing with the Stars » DWTS Season 19, Week 3 – Dancing by the Numbers! Since Randy had a score awarded to him, I’ve included that in my total. Do they do it that way? Well, they say total judges points awarded, but who knows. At this stage it makes little difference in the votes needed. As you can see, Bethany and Janel are way out in front and almost undoubtedly safe next week. Someone asked earlier today about the people who were underscored getting a ton of votes (Alfonso and Sadie) – my response was “sometimes”. We thought that about Corbin, though, and Amber ended up winning. Is it possible that Janel and Bethany were being over scored because they aren’t getting the votes? Again, hard to say. Both dances were very good – I just don’t think 40’s should be handed out in week 3, but I also don’t think that either woman would end up going home in week 4 if they *didn’t* have a 40. There are still weaker dancers and weaker fanbases left in the competition. For Janel and Bethany, the question is if their fanbases actually VOTE. Bethany’s is more massive than Janel’s but both are questionable in terms of voting. I do think one of them will be a shocking elimination in a few weeks and I tend to lean towards Janel, mainly because…Derek. Beth could have a bad dance due to her ankle, but Derek is a master and he’s never been a “shocking elimination”. Hard to say. It could be Beth if she has a bad dance the same week that Janel kills it. But I digress – Michael is once again our low scorer that is still in the competition. What does Michael have to do to stay in the competition next week? As you can see, Michael needs less than 3,000 votes per million votes cast to get past Antonio or Betsey. That is virtually nothing. Can he do it? I’m betting yes – but I’m not 100% confident on that one. If he can’t get past either Betsey or Antonio, he needs roughly 8,500 votes per million votes cast to get past Lea. This is also doable, just not sure it’s happening. This is going to be a tough week to call, for sure. Next in line, if he can’t get past Lea, Antonio or Betsey, is the triumvirate of Sadie, Jonathan and Alfonso – and I doubt VERY much he’s touching either Sadie or Alfonso. Not sure about Jonathan. In any case, he needs 11.4k votes per million votes cast to beat them. I tend to think that Antonio and Lea are the weak links here. Neither one is making a huge impact – this is especially true for Antonio, but he has Cheryl, arguably the most popular female pro. Tough week to call, people. Let’s say that Michael DOES beat Betsey and Antonio – what do they have to do to be safe? Geez, Betsey and Antonio only need 5,700 votes per million votes cast to get past Lea. And they each only need ONE vote per million votes cast to get past the other. 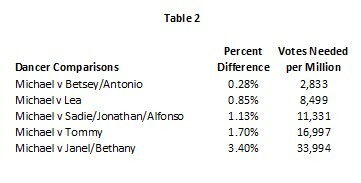 I tend to doubt that Antonio is beating either Betsey or Lea, but that might be because he’s not doing it for me. Lea needs 2,900 more votes per million votes cast to get past them. That leaves us with Jonathan. While he has the same score as Sadie and Alfonso, I’m really not sure that he’s getting the votes that I think Sadie and Alfonso are. So, while those two are likely safe from Michael, Betsey, Antonio and Lea, I’m not so sure that Jonathan is. So where does that leave us? Well, I’ve already said that I think Bethany and Janel are safe. I think that Sadie and Alfonso are also safe for reasons shown above. Tommy? One of the most popular contestants and he’s got a five digit vote lead on Michael, Betsey, and Antonio, and nearly 9k vote lead on Lea. I don’t think Antonio, Lea or Michael can touch him right now. Safe. That leaves us with Michael, Betsey, Antonio, Lea and Jonathan. Can Michael get the roughly 11,400 votes per million votes cast to get past Jonathan? I don’t think so, and I think that’s due to Betsey and Tommy. Like I said last season, there is usually only room for ONE person of a “type” and I think that Betsey and Tommy fill the role of quirky character that is an iffy dancer but loveable very nicely. So, I don’t think Michael is getting the Bill Votes to get past Jonathan. I also have a hard time believing that Antonio is getting 8,500 votes to pass up Jonathan. So I think Jonathan is safe. That leaves us with Michael, Betsey, Antonio and Lea. I don’t think Michael beats Betsey – she’s just got too many people rooting for her and she’s actually dancing not horribly. I think Betsey is safe. What are Lea’s needs? Michael, Antonio and Lea- I think it comes down to the three of them. I tend to think that Michael can get past Antonio, but not Lea. And I also tend to think that Antonio can’t get past Lea, and that Lea might be beating Jonathan. GEEEZ, this is a hard week. Thanks for being patient and reading through my logic. But I think I’ve convinced myself that it comes down to these three with Michael making it one more week and Antonio going home. I would not be at all surprised to find out that the bottom three consisted of Michael, Antonio and Lea OR Michael, Antonio and Jonathan. I also would not be at all surprised to be wrong and find that Michael is going home. I would be more surprised if it was Lea or Jonathan. 9 responses to "DWTS Season 19, Week 3 – Dancing by the Numbers!" Great post once again. This week is so hard to call. I wonder if johnathan was scored so highly to compensate for the lack of votes, I’ve not really seen many people supporting him online. I also think michael may get more votes than usual this week because the dance was so cute and sweet, that always seems to go down well with the audience, but we shall see. Heidi, just excellent again. After reading your new analogy, I better start preparing my Dad for the next elimination. As you know, he loves Cheryl. 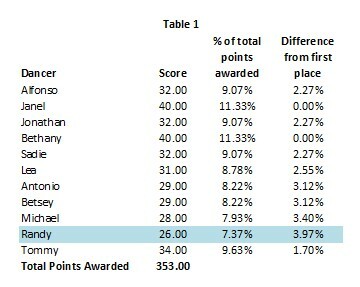 I can see Michael beating Antonio and Betsey too. I wasn’t impressed with Lea this past week either. So, it wouldn’t surprise me to see her in the bottom three and possibly even leaving. Anyway, excellent again!! Adding: and I hope Jonathan and Allison are safe. I love those two and I want to see more of Allison’s choreography. I never thought that Tommy Chong would ever be considered a safe candidate moving into week 4? I think he has been the biggest revelation of this season. I adore his partnership with Peta. Not sure if it’s this week or next week that Michael’s daughter is coming in to the show to watch her Dad. I do hope that he stays long enough to achieve that goal. With Johnathan just in the bottom 2 that leads me to believe the voters will rally to safety this week. Antonio? Is he still on the show? Plum forgot all about his dance. I think he is in the biggest danger this week. Week 4 is going to be tough to pick. I agree though that I think Michael is going to make it through another week. He had a decent dance this week and I think the NASCAR fans will outnumber any fans Antonio might have (even having Cheryl). Therefore I think it’s Antonio’s week to go. I REALLY need it not to be Lea as I already lost Randy who I had in my ideal final four so I at least need Lea there. The two people I really can’t figure out are Janel and Bethany to be honest. I definitely don’t think they’re going anywhere for the next few weeks but I’m having a hard time deciding about how many votes they are pulling in. I just wonder if Bethany’s followers are actually voting for her in force or if they are just watching her videos on youtube and “liking” things on IG and Facebook. With Janel I just wonder how many devoted fans she has and how many are just PLL fans and will lose interest eventually. I think one of them makes the finals and one is a surprise elimination and I go back and forth on which it is. I think the fact that Randy went first the second week really hurt him; the dance wasn’t as bad as the scores suggested, and while it was a really fun dance, I think people didn’t remember it as well as some of the later ones. Antonio would have been my call on who would be going home, and I was surprised when it was Randy – until I took a look at last week’s Dancing by the Numbers and saw the gap Randy had to overcome. I think if Antonio’s score had been closer, Randy might have survived. As far as the next elimination, I think Michael will make it through again – he showed marked improvement in his dancing, and he’s been promoting his being on DWTS – sometimes in really fun and clever ways – so I think his fanbase will keep him in at least another week. So I think Antonio and Betsey are the ones in trouble; as PH showed above, there’s not that big of a gap, and Antonio’s dance was pretty forgettable. Betsey’s, while it showed off her flexibility, and is *amazing* considering that she’s 72, didn’t seem like a real “wow” dance, especially since we’ve seen her flexibility before. While watching it, I was wishing that they had done a V waltz to it (though Tony threw some waltz steps in). I just preferred her foxtrot from last week to this dance. I’m really *hoping* that Lea has enough people voting for her, so that she will be safe – I honestly don’t think Antonio is beating her in the votes. While it wasn’t her best dance, it was memorable and made me smile, and Antonio’s didn’t. I can barely remember that he danced, let alone *what* he danced. I think Jonathan is going to be safe – partly because of Allison’s fans. Allison is probably one of the top five favorite contestants of all time from SYTYCD (along with Twitch, her husband – who might be *the* top favorite), and while I don’t know if all those fans overlap with DWTS or transferred over because of Allison being on the show – I think her fan’s, and Twitch’s fans (in addition to Jonathan’s and the people they’ve charmed from the general audience, of course), will be enough to keep them safe. Plus, he improved and the dance was memorable. Sadie and Alfonso being safe at this point seems to be a given, and everyone else’s scores were high enough that they shouldn’t be in danger. DLT, being a fan of Beth and Derek this season I was wondering the same thing at first. It seems like her fan base has gotten the gist of voting now cause they keep posting to vote on Twitter and RTing those tweets. I always enjoy the numbers post. This week was the first time that we voted this season and we spread our votes around (we have 5 e-mail accounts for our family and therefore 5 DWTSs voting accounts – not exactly power voters). Essentially we voted for everyone EXCEPT Michael, Antonio and Betsey (if we had more votes she would have gotten some from us). Our logic is that we voted for the people that we do not want to go home, vice voting for who we want to win at this point this early in the season. My teenagers had no idea who Janel and Bethany were before this DWTSs season, however they were very excited to see a couple of popular Youtubers (is that even a word?) in the audience to support Bethany, so if they were voting, then it would be for Bethany. Granted they also enjoy Tommy and Alfonso too. Praying Michael or Antonio go this week. As an Artem fan for ages now due to his UK exploits, I want Lea to get as far as possible. With their obvious lack of a fanbase compared to most other celebrities, she can only get so far and last week’s scores must put her in danger this week. If she goes out and gets 9s or 10s in her contemporary dance this coming week then gets eliminated ahead of Michael, Antonio and Betsey (although I do like her) then I’m sorry but that is a joke and really unfair on both of them. I just hope people voted.